With technology, online, mobile and user experience all firmly entrenched in travel, where does the travel agent (adviser) fit in the buying cycle? 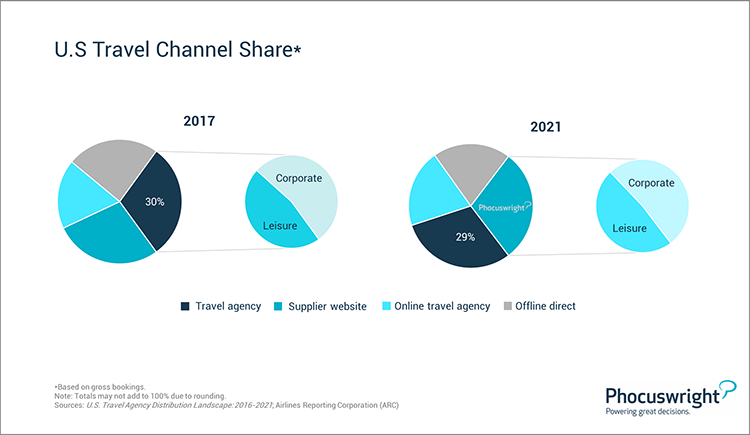 Phocuswright has been researching the travel agency distribution landscape in the U.S. since 2006. In the initial study, we assumed travel agency extinction – and were proved wrong. With business models changing, the need for professional and personal services remained high through 2013. What about now? Our most recent travel research on this segment shows that travel agents aren't only surviving, they're being courted. The overall U.S. travel agency market is forecast to reach US$127 billion by 2021, up from $112.8 billion in 2017. Driving this growth are air, cruise and specialized sales – and customers who are ready to pay someone to take care of their travel needs (rather than losing hours trying to find the best deal). Learn more about the size of the U.S. travel agency market, tech adoption, agency profiles, segmentation shopping and booking habits of clients, and more with Phocuswright's Phocuswright's U.S. Travel Agency Distribution Landscape 2016-2021. Open Access subscribers have immediate access to this publication. Not a subscriber? Learn more here.